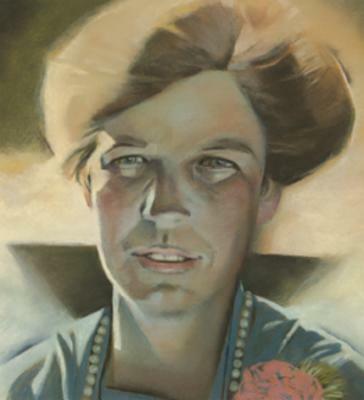 Eleanor Roosevelt was raised in a privileged but stern Victorian household, with an affectionate but mostly absent father and a critical mother who made fun of her daughter's looks. Alone and lonely for much of her childhood, Eleanor found solace in books and in the life of her lively and independent mind. Her intellectual gifts and compassionate heart won her the admiration of many friends -- and the love of her future husband, Franklin Delano Roosevelt. While other young women of her class were spending time at dances and parties, Eleanor devoted her energies to teaching children in New York City's poorest neighborhoods. Later, she became the most socially and politically active -- and controversial -- First Lady America had ever seen. Ambassador, activist, and champion of civil rights, Eleanor Roosevelt changed the soul of America forever. In her eloquent prose, Doreen Rappaport captures the essence of Eleanor's character and the deep significance of her legacy. With beautiful paintings by Gary Kelley and selections from Eleanor's own writings, Eleanor's Big Words is an extraordinary tribute to an extraordinary American. Doreen Rappaport has written numerous award-winning books for children, including: Freedom Ship and The School Is Not White (both illustrated by Curtis James); Martin's Big Words: The Life of Dr. Martin Luther King, Jr., a Caldecott Honor Book and Coretta Scott King Honor Book; and John's Secret Dreams: The Life of John Lennon, also illustrated by Bryan Collier. She lives and writes in upstate New York. Gary Kelley earned a degree in art from the University of Northern Iowa in Cedar Falls. Among his many awards are twenty-three gold and silver medals from the Society of Illustrators and the 1991 Hamilton King Award for best illustration. Mr. Kelley lives in Cedar Falls.